It’s not even been a year and the Nintendo Switch is slowly building a strong library for itself with plenty more to come as we approach Christmas. Of course, big releases like Mario Kart 8 Deluxe, Splatoon 2 and The Legend of Zelda: Breath of the Wild are the ones grabbing headlines, but let’s not forget the numerous indie efforts that have been populating the eShop as well. Games like FAST RMX, the Jackbox Party Pack series and Death Squared filling in those gaps between AAA releases quite nicely. Which brings us to what will be a familiar name for many a gamer. If you’re one of those who’ve never dipped into the disgusting, bleak world of The Binding of Isaac then threat not I’m right there beside you. My review is coming from, in a word, a ‘newbie’. You see The Binding of Isaac: Afterbirth+ is my very first experience with the game and one that has had me coming back, delving deeper into its ludicrously packed adventure. This dark quest sees you take on the role of a young boy named Isaac who lives happily at home with his mother. Unfortunately urged on by watching far too many religious shows, she locks her son in his room, takes away all his toys and eventually attempts to sacrifice him after claiming to have been instructed by the voice of God. Luckily young Isaac escapes her clutches through a trapdoor in his room that leads to the basement and its here where his adventure (or rather nightmare) begins. The visual style of the game was one of the first things to stick out for me, its overly revolting imagery complete with biblical references aplenty as well as excrement, blood and guts. Personally, I’m not a huge fan of the direction this game leans so heavily into and while I’m not one to usually steer away from games of a violent of sometimes gross nature, there’s something about The Binding of Isaac: Afterbirth+ that feels just a little too much for me. As for the gameplay itself, The Binding of Isaac: Afterbirth+ handles like your typical arcade twin-stick shooter with a little The Legend of Zelda thrown in for good measure. You’ll control the young Isaac through a series of randomly generated rooms using your tears to attack any monsters or demons along the way. Initially, Isaac will only be able to fire in four directions (the usual up, down, left and right) but items found to offer the boy abilities that can alter both his projectiles and passive attacks. This might be the ability to fire your tears in rounds of three or in arcs or even leave behind a trail of tar that will slow enemies following. Every playthrough brings with it random items and without any explanations as to what each does it’s very much a game of experimentation. Furthermore continued to play eventually unlocks extra characters each again with their own unique characteristics to try out. The Binding of Isaac: Afterbirth+ is a roguelike experience through and through and that will either draw you in (as it did me) or turn you off. First of all the game is tough. Very tough, even on the easier difficulty. This is in part due to the random nature of each playthrough, with layouts, enemy placements and item drops playing a large role on difficulty. Sometimes you may have the perfect line-up of useful items along with weaker enemies. Sometimes you might have a nightmare blend of bad items and painful enemy types. It’s very much luck of the draw which does add to the replayability sure but can mean some runs are destined to fail despite best efforts. Another aspect that adds to the overall difficulty is the fact there are no save points. While the game is a short one to get from start to finish, dying at any point will result in having to restart your adventure from the very beginning. And trust me you will die a lot. 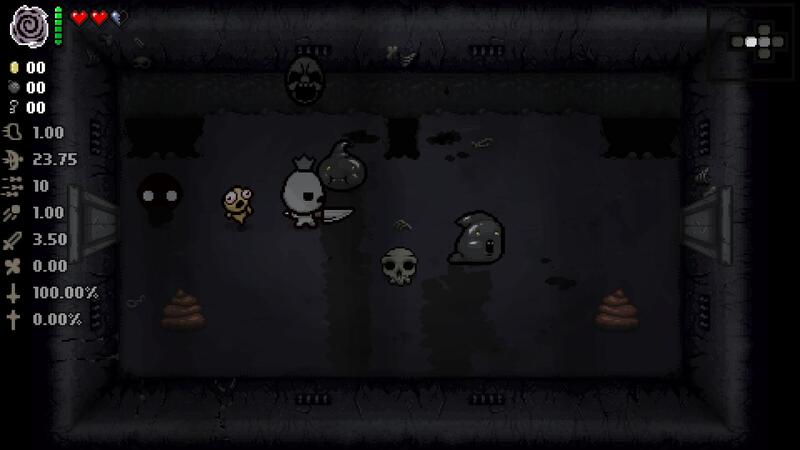 The Binding of Isaac: Afterbirth+ has a very old-school feel about it giving little help or instruction where the best way to advance is by learning from previous runs and mistakes. Once you’ve managed to defeat the final boss though, there’s still plenty more to tackle including challenges, getting the remaining endings, unlocking characters and discovering more of the hundreds of unique items in the game. This is a game that fans of the genre could easily spend countless hours in. 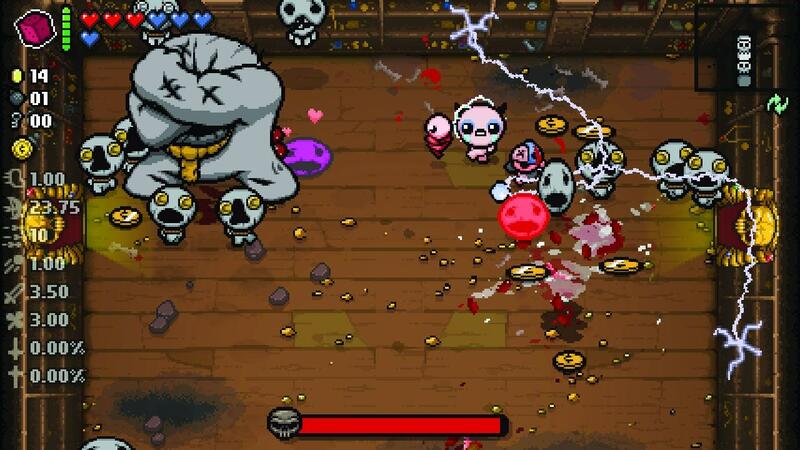 Co-op multiplayer is included too for up to four players where those joining Isaac can spawn as ‘familiars’ each with their own unique abilities. While having a team to aid you through your journey may sound helpful, it also comes at the cost of one of the hearts from your health meter. It’s a great extra and one well suited to the Switch but can make the screen very busy especially with four people playing. The Binding of Isaac: Afterbirth+ is a tough as nails roguelike experience packed full with a ridiculous amount of content. Ideal for quick 10 or 20-minute run attempts here and there, the game feels right at home on the Switch whether you play handheld or docked and while its gross-out style and frustratingly random difficulty might put some off, those that persevere will find a rewarding albeit dark experience.